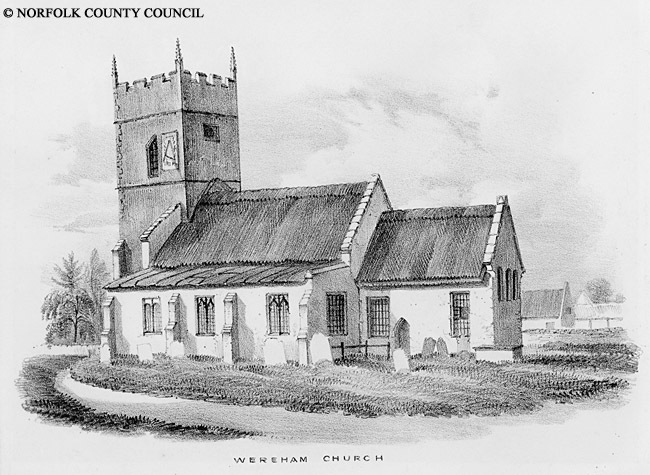 Phil Norris offers this insight into Wereham with a description of the village in 1925. How things have changed! The church of St. Margaret erected in the 13th century, is a small and plain building of flint and stone, consisting of a chancel, nave, aisles, and an embattled western tower with pinnacles, containing a clock, presented by the late Rev. Augustus Sutton M.A. rector of West Tofts from 1849 to 1885. In 1920 a cross of Clipstone stone, mounted on a shaft of the same material, and 16 feet in height, was built into a recess in the churchyard wall as a memorial to the men of the parish who fell in the Great War, 1914-18. There are Wesleyan and Primitive Methodist chapels. An army hut, given by the Y.M.C.A. was opened in 1921 as a social institute for men and women; it contains concert, billiard and reading rooms. In the centre of the parish is a large pond, supplied by a fine spring of water called "St. Margaret’s Well". The soil is a mixed loam; subsoil, in some parts gravel, and in others sand and clay. The chief crops are wheat, barley and turnips. The area is 2,228 acres. The population in 1921 was 464 in the civil and 810 in the ecclesiastical parish. Public Elementary School, erected in 1876, for 101 children; Thomas Wells, master.